KNOXVILLE—The monk parakeets that have invaded Europe and North America over the last 40-50 years fortifying their massive communal nests atop utility poles in many urban areas appear to have originated from the same small area in South America, according to a new study. Considered one of the best speaking parrots, thousands of these bright green birds have been imported for the pet trade, and feral populations began appearing in the United States in the 1960s and in Europe in the 1980s. And yet, these two independent invasions—in the United States and in Europe—appear to have originated from the same small area in the native range, likely located in Uruguay, according to the new study, which appears online in the journal Molecular Ecology. The study, which unravels the global invasion history of the monk parakeet, also found that that the North American and European monk parakeets have lower genetic diversity in their invasive populations compared to the genetic diversity in native populations. This is unusual because invasive species with greater genetic diversity often have a greater chance at survival—a more diverse gene pool means more variety in traits of individuals for natural selection to act upon and allow the species to survive and thrive in a new area. Until now, very little has been known about the genetic processes linked to successful establishment of invasive parrots. Yet, a better understanding of the genetic linkages could shed light on the potential success of an invasion. For the study, an international team of researchers based at institutions in Spain, the United States, Canada and Australia used mitochondrial DNA and microsatellite genotypic data to investigate the levels of genetic variation and to reconstruct the history of the invasions. The study raises interesting questions about why the two separate invasions show such similar genetic patterns. "One possibility is that these invasive populations may be under similar selection pressures. Most of the invasive populations are restricted to urban and suburban habitats, which may be selecting for some key traits that increase fitness of individuals in those environments," said co-author Elizabeth Hobson, a postdoctoral fellow at the National Institute for Mathematical and Biological Synthesis, which helped support the research. Social behavior may also affect invasion success, Hobson said. "It could make it easier for a species to invade a new area and survive, or it could inhibit invasions in other circumstances," she said. In their native range in South America, monk parakeets have become notorious crop pests devouring cereal grain and citrus fruits, and they have the potential to become the same especially in Florida with its citrus crops, although so far they have had minimal impacts. 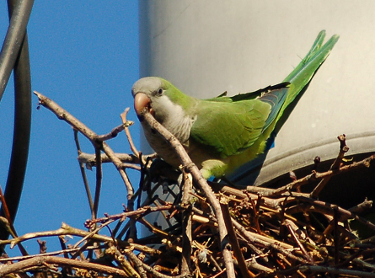 In their invasive range, monk parakeet activities can cause problems for electrical companies. Their massive nests of sticks atop utility poles can disrupt power and damage equipment. In the late 1960s and early 1970s, tens of thousands of parakeets were imported to the United States as pets. Many birds have been released either deliberately or by accident by their owners, and some may have also escaped during transport. The monk parakeet has now been documented in at least 14 US states with the highest concentrations in Florida and Texas. They also roost in urbanized areas such as New York City and Chicago where they form large, noisy flocks that can be heard for great distances. Some people still keep the birds as pets, although ownership is illegal in some US states. The National Institute for Mathematical and Biological Synthesis is an NSF-supported center that brings together researchers from around the world to collaborate across disciplinary boundaries to investigate solutions to basic and applied problems in the life sciences.